Nationalism exists alongside xenophobia as an ideological and political trend. In Russia xenophobic attitudes are widespread and escalating whereas nationalism as such does not have a very broad base. It has a small group of adherents and negative perceptions of nationalism among the public are widespread. The number of people who reject nationalism is fairly high and stable. The so-called Russian March recently took place in the center of Moscow along with several other rallies. Kirill Rogov, leading research fellow at the Gaidar Institute for Economic Policy, believes it is no surprise that the march was held in the center of Moscow and that the city authorities allowed it without interference. “If the application for this event offered the authorities no cause to turn it down, why should they ban it?” he said. “Like protest rallies, the Russian March was also held downtown and this is only natural,” Rogov said. “Every time the authorities first try to impose restrictions but then issue a permit anyway. I can’t imagine what arguments they could have made to justify requiring that the Russian March be held on the outskirts,” Rogov said. He explained that nationalists usually take part in joint opposition rallies but that they are not big. They are highly diverse and carry many flags. This is why they look like a large group but in reality they are not. “They are well organized and march in file, making maneuvers in order to draw attention, but they do not account for a big part of joint opposition rallies. They have lots of items with their logos on them and are a well-organized unit that follows the commands of their leader and all this looks impressive,” Rogov explains. He observed that their organized column stands out from the bulk of the opposition rallies – ordinary people carrying their own hand-made posters and walking separately. This column stands out, and it seems that nationalists are a big part of the march when, in reality, they are a small group. Speaking about the nature of the nationalist march, Rogov cites sociological data pointing to the existence of two similar but still distinct phenomena. Xenophobia is one. Rogov believes xenophobic attitudes are very typical of rapidly growing large cities with high incomes and a significant flow of guest workers. All this applies to Moscow. He said a strong flow of immigrants naturally creates tensions because the locals see a lot of different faces. This happens in every city with a more or less open society and high economic growth rates. “In Russia, economic growth rates are sometimes high despite unfavorable demographics. 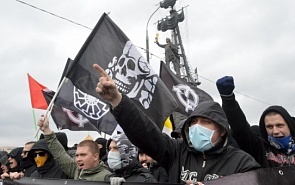 This is why xenophobic attitudes emerge,” Rogov believes. He observed that nationalism exists alongside xenophobia as an ideological and political trend. Xenophobic attitudes are widespread and escalating whereas nationalism as such does not have a very broad base in Russia. It has a small group of adherents and negative perceptions of nationalism among the public are widespread. The number of people who reject nationalism is fairly high and stable. Rogov said this is true of half the population. He said nationalists are trying to exploit xenophobic attitudes in their favor, but their success depends greatly on society, its response, the policy of the authorities and their position on immigration, the effectiveness of the police and the success of efforts to promote tolerance. “These factors determine the success of nationalists in exploiting xenophobia,” Rogov concluded. He explained that these problems can be resolved if a sensible approach is taken. “The problems causing xenophobia and immigration problems can be discussed rationally and put into some sort of framework; tolerance can be fostered in society and the police can prevent these problems from becoming extreme and resulting in clashes. If the policy of the authorities is not very thoughtful or effective, nationalists will be able to use xenophobia to increase their influence,” Rogov explained. Nationalism exists alongside xenophobia as an ideological and political trend. In Russia xenophobic attitudes are widespread and escalating whereas nationalism as such does not have a very broad base.